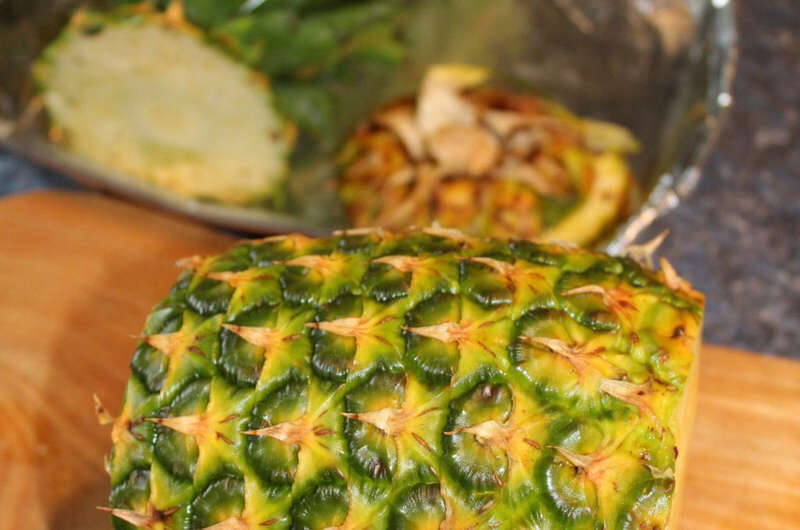 There’s nothing more wonderful than fresh pineapple! 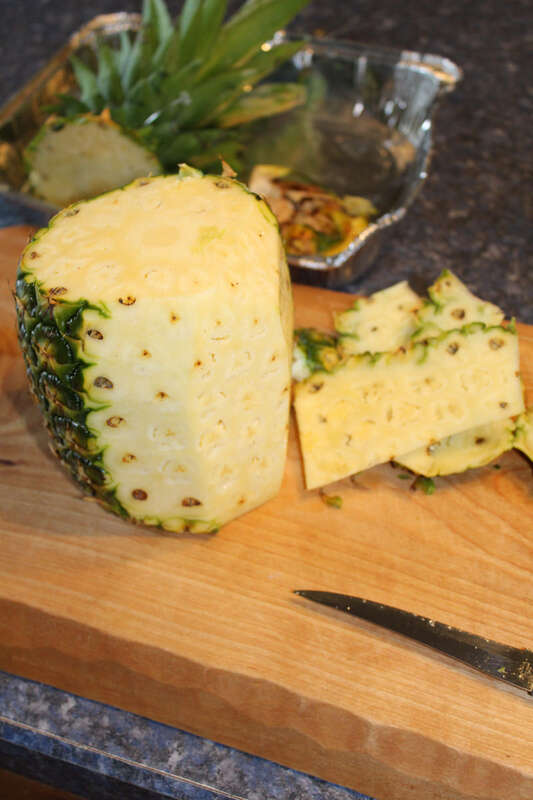 My family absolutely loves pineapple and can’t get enough of it when it’s in season. 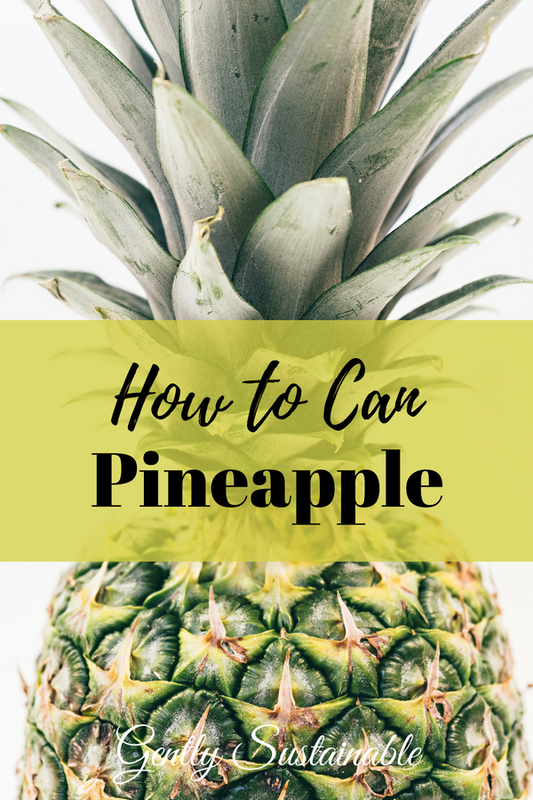 So why not learn how to can pineapple when it’s in season and cheap at the store? I was able to score some large .99 (each) pineapple this week! Since it’s raining cats and dogs here in Ohio, and I can’t work in my garden – it makes sense to get some canning done. 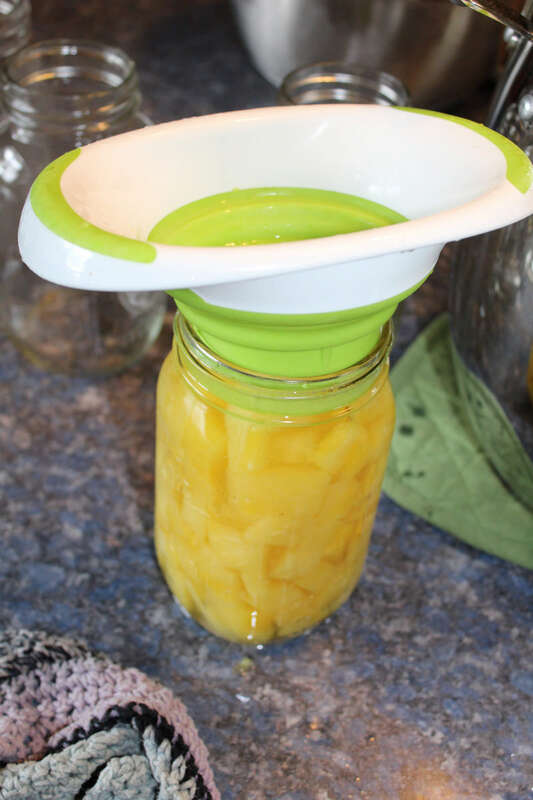 Since pineapple is a high acid food, you’ll be able to use the water bath canner. 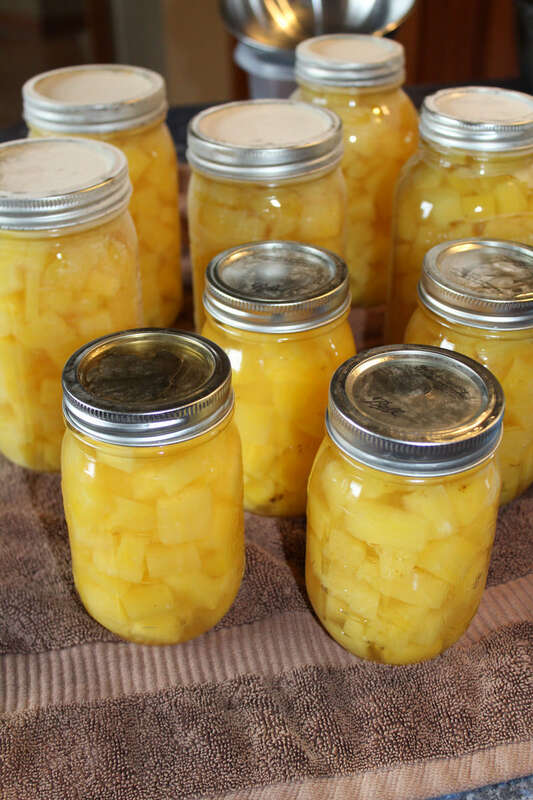 When canning pineapple, you use a sugar syrup to aid in the preservation. 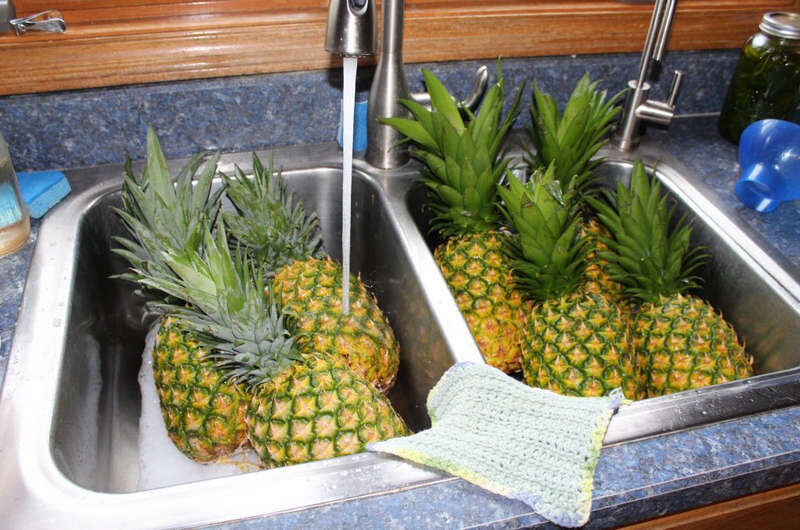 Wash the pineapple with cool, soapy water to remove any dirt/bacteria on the outside of the fruit. I like to do this in the sink. Next, set up your work area, including your knife and cutting board. Keeping a compost bucket nearby is a good idea, as well. 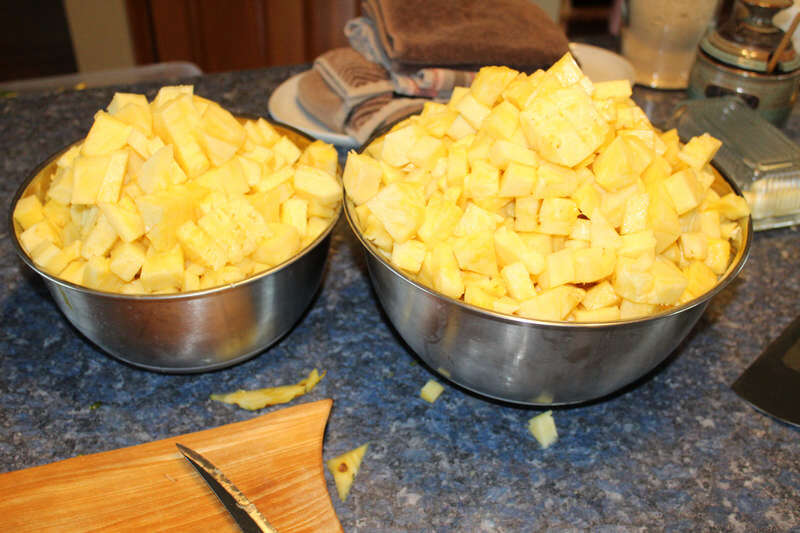 Go to work, carefully peeling and dicing the pineapple into the size chunks you desire. I would suggest 1″ chunks, so that you can get them out of the jar. You could always use wide-mouth jars, if you have some handy. As you chop, put the finished pieces in a clean bowl. Keep your work area uncluttered by putting the peels in the compost bucket frequently. 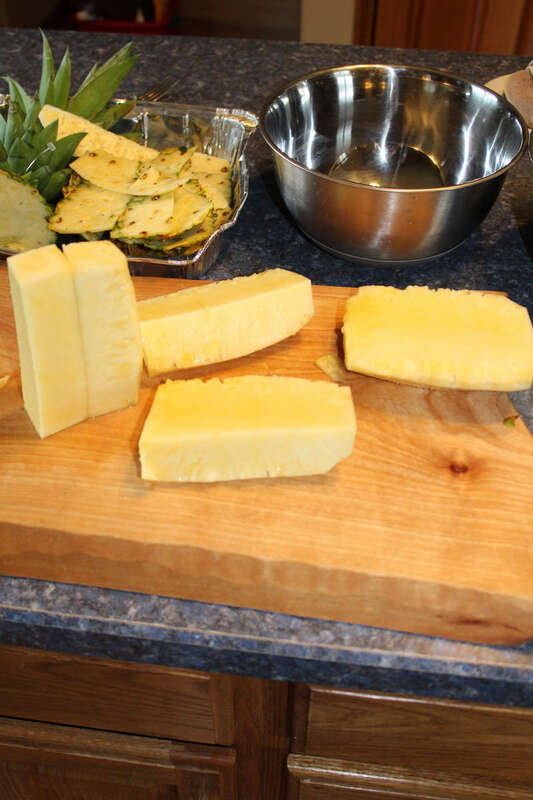 Once you are finished chopping all of the pineapple, it’s time to make the syrup. 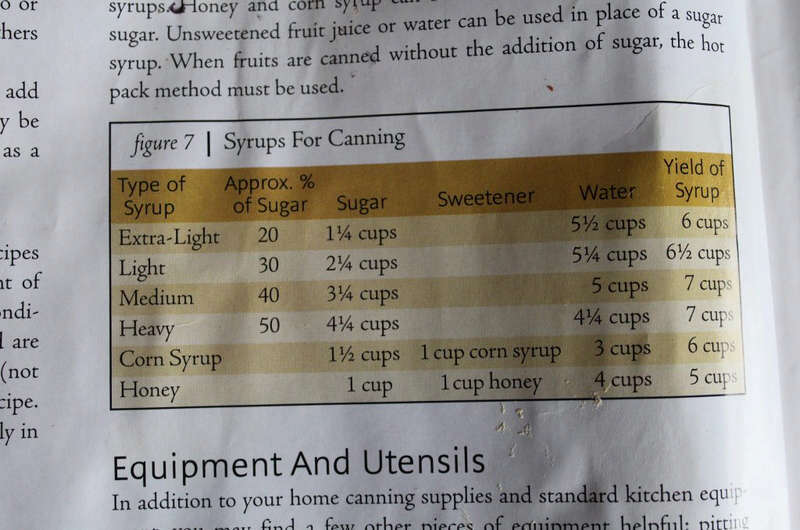 The syrup is nothing more than sugar and water, but you’ll have to decide how sweet you want your syrup to be. I prefer the extra-light syrup. 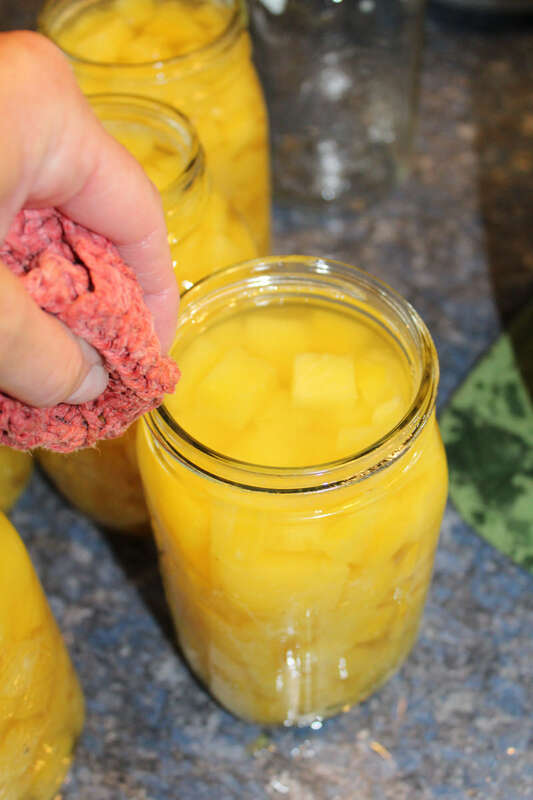 Wash and sterilize your jars while you wait for pineapple to cook. Once the pineapple is tender, it’s time to put the fruit in the jars. Using a funnel, pack each jar with fruit and syrup with 1/2″ of head space. 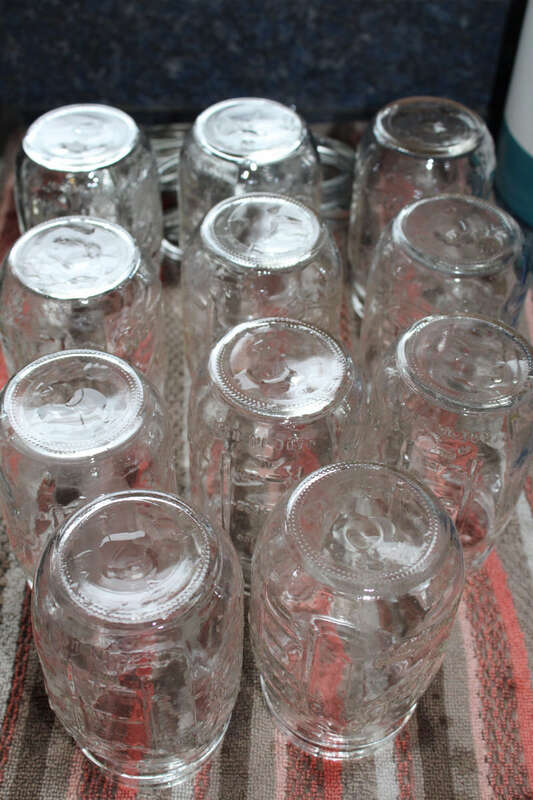 Wipe the rim of the jar with a clean cloth before placing warm, sterile lids and rings. 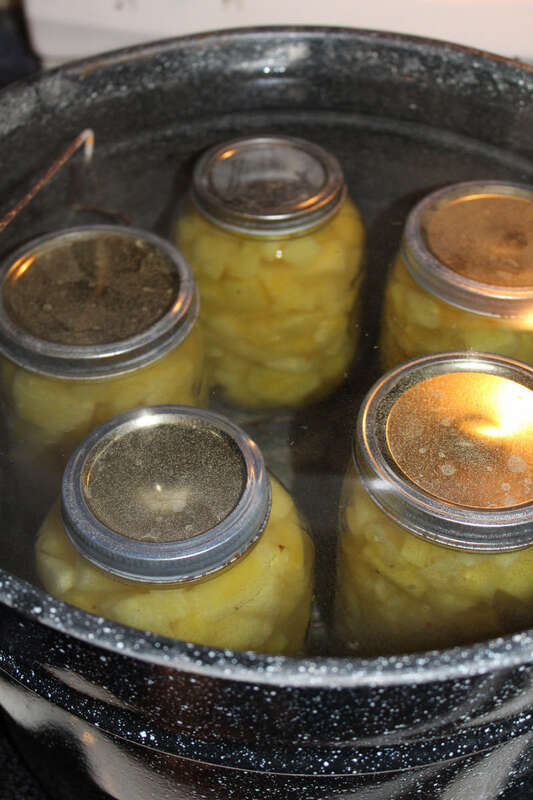 Place the jars in the canner, making sure to give each jar enough space to not bump each other during cooking. Also, make sure the jars are covered with water by at least an inch, preferably 2″. Bring the water to a gentle boil, and then turn heat down slightly. Maintain a consistent boil until time is up (20 minutes for quarts, 15 minutes for pints). Remove jars and place on kitchen towel to cool off. Wait for the lids to pop, which is the most fun part! Ping! And there you go, beautiful jars of pineapple to enjoy! 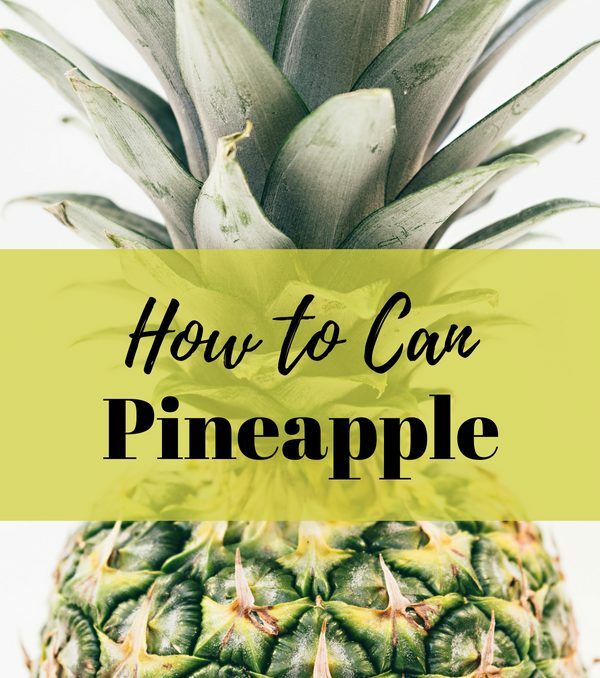 Why cook the pineapple? I prefer it uncooked and not mushy. It is going to cook simply by being in the canner, but if you cook it beforehand it will be pretty mushy, no? Hi Carol! I questioned that myself. My thinking is that a raw pack would be just fine, I was just narrating as from the Ball Canning Book. 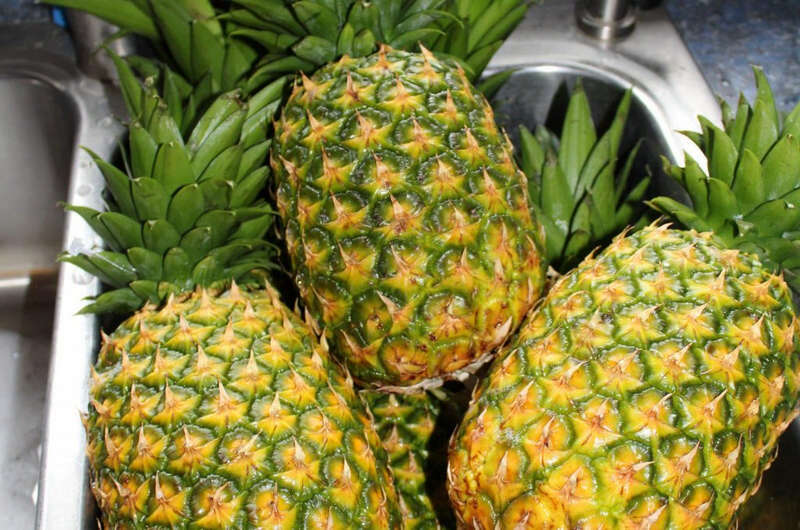 Fresh pineapple is amazing!! Thanks for sharing on Homestead Blog Hop!